Just about any hard to find part, we can usually get it. Check with us! WE can supply you with just about any hard to find part you are looking for. Whether you are looking for a Side-Oiler 427 block, Tunnel Port heads, etc., WE can find YOUR part for you. 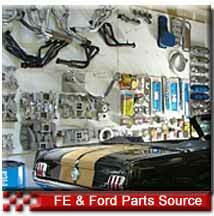 We stock many FE, 460, and small block parts and we can locate the rest. Can't find that Cross-Boss intake? We can. What can we help you find? Ask Us.